Fantastic, early concept artwork for Ridley Scott's ''Alien'', the 1979 sci-fi horror film that became an instant legend, unique in its genre for winning an Academy Award for Visual Effects. Large artwork measuring 17'' x 19'' shows a possible scene of a woman (likely Ripley's character) walking through a rotating passageway, perhaps to simulate zero gravity in the spaceship, below which appears another sketch of the mechanics of filming within the rotating passageway. 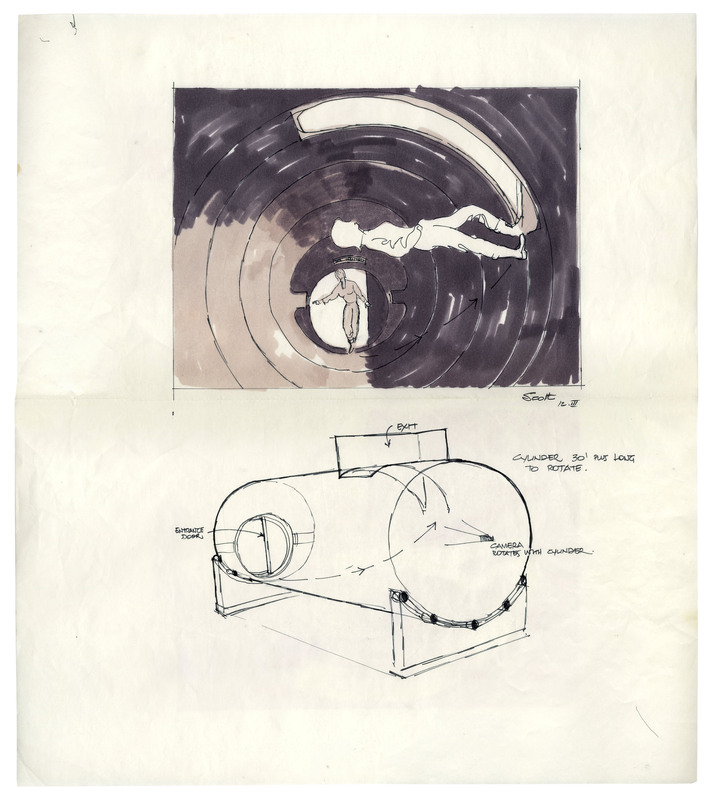 Sketch has the following notes, ''Cylinder 30' plus long to rotate'', ''Camera rotates with cylinder'' and the entrance and exit for the passageway. Artwork is dated 12 March  and signed ''Scotty'', likely by Elliot Scott, uncredited on ''Alien'', but who served as Production Designer for two of the Indiana Jones films. Artwork is rendered in pen and marker, measuring 17'' x 19'' on thin construction paper. Fold between the two sketches, overall near fine condition. From the collection of former 20th Century Fox executive Peter Beale, whose COA accompanies the lot.